RECENT findings by a group of American researchers suggest that even the remote continent of Antarctica exhibits evidence of contamination, mainly due to scientific support activities, an ever increasing number of visitors, ship operations, atmospheric fallout and disposal practices. And all these pose a serious threat to the marine environment of the continent (Environmental Science and Technology, Vol 29, No 5). 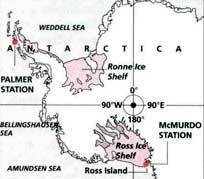 A team led by Mahlon C Kennicutt ii of the Geochernical and Environmental Research Group of the Texas A&M University, and consisting of environmentalists of many us research institutes studied 2 scientific locations in the icy continent - the Palmer Station, located on Anvers Island in the Antarctic peninsula, and McMurdo Station, located on Ross Island. They reported concrete evidence of the presence of polycyclic aromatic hydrocarbons, polychlorinated bi-phenyls (PCBS), pesticides and trace metal concentration at the 2 sites. Says Kennicut, "Local releases of fossil fuels in the scientific research stations, disposal of waste materials, aging of ship and station structures have been the potential sources of contamination. High concentration of PCBS were detected from sediments and organisms from Winter Quarters Bay (near McMurdo Station)." The commonly used fuels in the scientific research stations, include diesel fuel arctic, diesel fuel marine, and leaded and unleaded gasoline, have also contributed to the problem. Wastewater releases, in the form of sanitary sewage, laboratory discharges, brine from desalinators, fuel spills due to leakage from the fuel pipelines, and visiting ships have greatly added to the contamination of the marine environment. These findings are significant because cold temperatures in the icy continent tends to immobilise the contaminants, and this is likely to have dangerous consequences in the long run. "Contaminants are detectable in Antarctic organisms, and the expectation is that the contaminants are transported along the food chain. In some cases, the levels of bioaccumulation of contaminants in marine organisms has been found comparable to those observed in inclustrialised areas," argues Kennicutt.